I had thoughts of limiting my growing instincts this year; maybe letting some of the garden beds go back to lawn. That all changed the day the leaves flushed out on the maples and softened the skylines with a green/yellow mist like a watercolor. In this watercolor the dogwoods wore wreaths of white flowers and danced like graceful ballerinas alongside purple studded red-bud trees. All this beauty prompted me to take a country drive on my way back home from town. It seemed like the end to a perfect afternoon when I saw a sign in front of a garden that I have always admired that read, “Free plants, you dig.” I could not resist, I slowed down, stopped and got out. The gardener handed me a shovel. I dug. She is downsizing. I know that she is just a little bit further down the trail than I and for her, sanity has won out. I might join her in a year or two but for now insanity still reigns and I will make another go at it. Everything seems possible in the spring, even keeping an acre and a half of garden, weed free. I can do it! The lady of the garden disappeared before I could ask her any questions. I became puzzled out in her garden and at one point I was trying to decide if a certain plant was a poppy or if I was digging up a slew of plain old thistles. There were lots of lamb’s ears, daffodils, tulips, hyacinths, day-lilies, bee balm, yucca and hostas but what I found most interesting was a plant that I didn’t recognize at all. From a distance it seemed the color of bluebells. On closer assessment I found that they were not bluebells at all. They are shyer than bluebells and shorter. The entire plant is very hairy. It has splotched leaves and the flowers are enchanting little blossoms of blue, purple, raspberry and pink bells all tolling together in harmony. I had never seen anything like it. I posted my picture to some gardening friends and sure enough one of them came up with the answer. 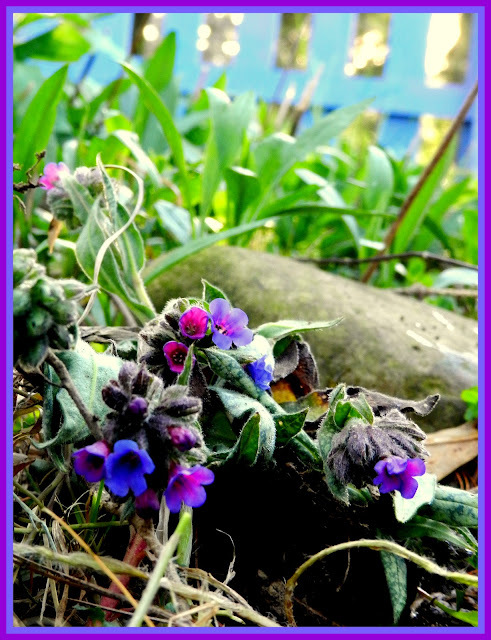 Lungwort. Pulmonaria. What a strangely named plant I thought and then spent some time looking up more about it when I was not nestling plants of it into my yard. It did not take too well to being moved and I had to coddle it. It begged to be planted in the shade and drooped if I didn’t keep its feet wet. I found out that this little beauty has other common names that are not so ugly sounding. One name for this little plant is Faith, Hope and Charity in reference to the blend of colors. Many of lungworts local names are biblical names, such as Mary’s Tears, Sage of Bethlehem, Jerusalem Cowslip, Lady Mary’s Tears, In the language of flowers this shy little plant means, Thou art my Life. Thou art my Life, how poetic! Dear Robin, Don't covet. Just plug some plants into the ground, you will have flowers before you know it. Don't make it too hard on yourself, it is not complicated, plants want to live and grow. Learn as you go, Lord knows I did. My garden is not always beautiful, it has good days and bad days and so do I. Beauty though is always waiting to be seen no matter where we are.